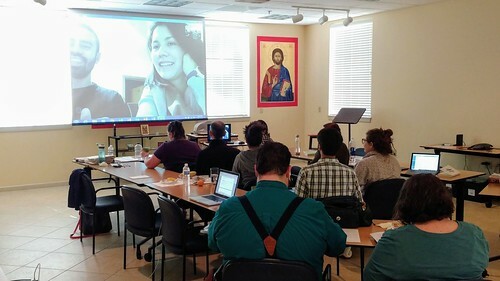 Missionaries Stephanos and Alexandria Ritsi teaching the new candidates remotely from Albania. Last week at OCMC, we were happy to host another new missionary candidate orientation! We had 7 individuals here, going through the various training sessions over the course of the week. The candidates had a very full few days here, as they learned about everything from cultural awareness, to support-raising, to stress and self-care. Their sessions were taught by a combination of OCMC staff members and missionaries in the field, teaching remotely. The new candidate orientation process gives missionary candidates a valuable chance to strengthen their understanding of missionary work, further discern their calling, and form relationships with one another and with Mission Center staff - all of which will help support and carry them through their time of preparation and service in the mission field. We currently have 28 long-term missionaries serving around the world, and it’s very exciting to have even more preparing to join them! Every missionary that follows his or her calling becomes invaluable to the life of the Church - not only for the people they are serving, but for the churches back home as well. By venturing out into the mission field, they give the rest of us the opportunity to participate in missions ourselves by supporting them. By sharing their news and presenting their experiences to our parishes when they visit, they reinvigorate our communities and remind us of the great joy that comes with sharing the Gospel of Christ around the world. As always, please pray for all of our present and future missionaries. They are called to take up a great burden, but with it come great joys and blessings as well - for all of us. If you feel called to explore short-term or long-term missionary work yourself, or at least support these endeavors, please visit us at ocmc.org!